Tom Chambers is currently undertaking a PhD in atmospheric physics/optics. 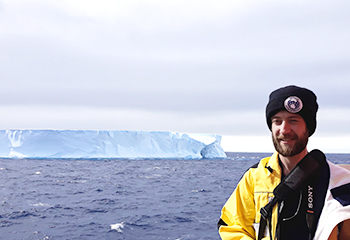 From October to December in 2018, as part of his PhD research, Tom travelled to Davis Station, Antarctica to deploy atmospheric measurement instruments to determine the role of clouds and precipitation in the Earth’s climate system. Tom wrote the following blog post to tell us more about his time on the world’s southernmost continent. I’ve always been curious about how natural systems work and I find the many mysteries and unsolved problems within this area to be deeply fascinating. The Earth’s atmosphere hosts a wide range of complex and beautiful phenomena which can help us to understand the fundamental processes that lead to their formation. Understanding of these processes is crucial to overcoming important issues such as climate change and the forecasting of extreme weather events. 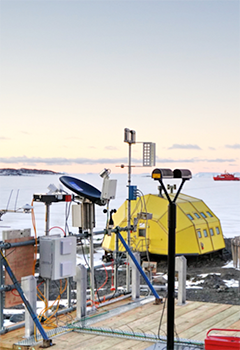 A selection of some of the instruments installed at Davis Station as part of our observation campaign. Clouds are currently a large source of uncertainty in climate models, especially over the Southern Ocean and Antarctic regions. Clouds here contain mixtures of ice and super-cooled water that are not currently accurately represented. My research investigates microscopic processes that occur in clouds, such as the role of turbulence in the formation of ice crystals and water droplets. To do this, my research team and I have developed a laser based instrument that can make 3D holograms of these particles. The holograms allow us to measure the particles’ shape, size, and clustering. By comparing our observations to other atmospheric instruments, we can begin to build an understanding of the full life cycle of clouds and better represent them within climate models. To get to Antarctica, we spent two weeks on the ice-breaker Aurora Australis. We deployed our instruments on the ships railing to measure precipitation. Our instruments were located alongside others from a range of research organizations. We were also lucky enough to observe many beautiful distractions along the way, ranging from leopard seals to a stunning Aurora Australis lighting the skies above. 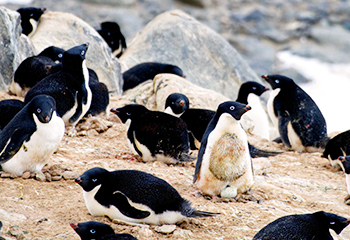 Nesting Adelie penguins on Gardner Island, a short walk over the frozen sea ice from Davis Station. On reaching Davis Station, much of our time was spent installing an extensive range of instruments around the Station Limits. These instruments included a high powered laser that can measure directly inside of clouds developed by the Australian Antarctic Division, along with a flux tower for measuring snow drift properties, and a scanning precipitation radar provided by our Swiss collaborators from EPFL. Davis Station is a particularly dry part of the world, and so we will leave our instruments there for the coming year to build up an understanding of this crucial link within the Earth’s atmospheric system. Whilst we were on the mainland we had the chance to see some really beautiful landscapes and animals, such as the nesting Adelie Penguins shown on the right. 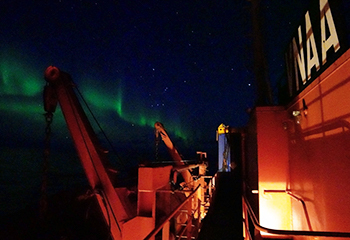 A shimmering Aurora Australis lights the skies above us aboard the Aurora Australis icebreaker. Now that we have returned to a noticeably warmer climate, our next step will be to deploy our instruments on a weather balloon to measure directly inside the clouds. This could be performed routinely to provide a significant increase in available data, as the current approach is to run expensive dedicated aircraft campaigns. We will also be analysing the data throughout the year from our Antarctic instruments, along with observations from another campaign last year in the Snowy Mountains. The observations from Antarctica have been truly unique, and the discoveries that this can lead to are quite exciting. I encountered a range of breathtaking sights, and the amazing people that I got to know made the experience truly incredible. I would strongly encourage other students to take up overseas research opportunities for themselves in the future. This entry was posted in Antarctica, Faculty of Sciences, PhD Students, Student Blogs, Student Experience and tagged academics, Antarctica, Blog, Faculty of Sciences, PhD, research, Student Experience. Bookmark the permalink.